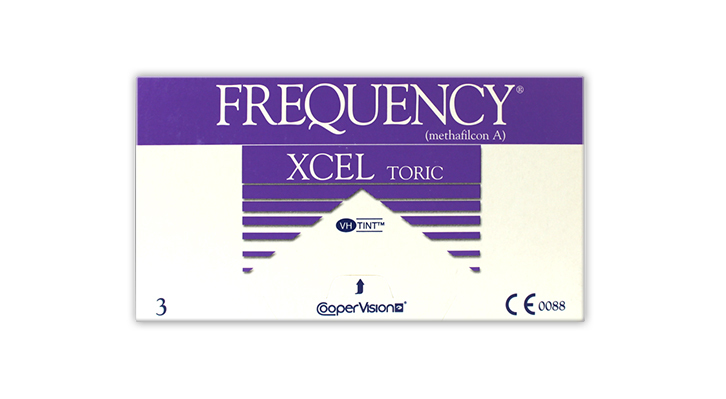 Frequency Xcel Toric contact lenses by Coopervision. Precision crafted using material that is highly resistant to deposits allowing for long hours of comfortable wear. Each box contains 3, monthly disposable toric contact lenses for astigmatism in buffered saline solution. I normally have a problem with contact fogging up or getting blurry due to my astigmatism but these contacts are great! They never fog or get blurry. They are comfortable and I forget I have them in and for the price you get much more than your money's worth. These lenses are a lifesaver - I never feel them and as an extra plus they are lighty blue tinted, which enhances my blue eyes. Would def recommend!